US chemicals giant DuPont is facing a lawsuit accusing the company of failing to warn consumers about the health hazards of Teflon non-stick coatings. Two Florida law firms said they were filing the suit on behalf of 14 people who bought and used Teflon cookware. DuPont denied the claims, stating its products were safe and has vowed to vigorously defend itself. Plaintiffs want DuPont to spend $5bn to replace million of people's pots and pans and to issue Teflon warnings. They also want a fund to be created for medical monitoring of people who bought Teflon products. Teflon was invented in the 1930s by DuPont, the US firm which uses it today to make non-stick cookware, and also markets it as a coating for clothes and carpets. It contains perfluorooctanoic acid (PFOA), a chemical which some scientists say is "likely" to be carcinogenic to humans. "DuPont has known for over 20 years that the Teflon product and the PFOA chemical it contains causes cancer in laboratory animals," said Miami-based lawyer Alan Kluger. "I don't have to prove that it causes cancer. I only have to prove that DuPont lied in a massive attempt to continue selling their product." However DuPont, denied the claims. "Consumers using products sold under the Teflon brand are safe," a spokesman said. "Cookware coated with DuPont Teflon non-stick coatings does not contain PFOA." Last year, the company agreed an out-of-court settlement in a class action lawsuit brought by about 50,000 residents who lived near its West Virginia plant. The residents, who lived along the Ohio river south of Parkersburg, West Virginia, claimed the company had contaminated local water supplies with PFOA. They alleged the chemical was linked to birth defects and other health hazards. 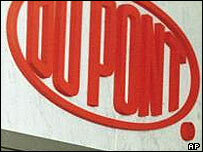 DuPont eventually agreed to pay $50m in cash to the plaintiffs, plus $22m in legal costs. It also agreed to spend $10m on special water treatment facilities to filter out PFOA. But DuPont did not accept liability and has maintained that PFOA does not pose any danger to the public. In May this year, DuPont received a subpoena from the US Environmental Crimes Section to turn over documents about PFOA. That followed an agreement from DuPont to settle allegations by the Environmental Protection Agency that it had failed to disclose heath data about PFOA for 20 years.